These are the show notes to an audio episode. You can listen to the show audio by clicking here: http://traffic.libsyn.com/airspeed/AirspeedICASAS101.mp3. Better yet, subscribe to Airspeed through iTunes or your other favorite podcatcher. It’s all free! I’m once again at the Paris Hotel in Las Vegas for the annual convention of the International Council of Air Shows (“ICAS”). It’s the annual event at which the airshow community in North America gets together to talk about the recently completed season, catalog the collective experience, and plan for the next year’s operations. Just about everyone who matters in the airshow industry is here in person or represented in one way or another. I attend ICAS each year on media credentials. It’s a great opportunity to meet the performers whom I cover and make connections that help me to produce the show. The T-38 episode from January of this year was a direct result of a contact made at ICAS. Additionally, many of the performer cameos that you’re going to see in Acro Camp resulted from conversations over coffee or beer at ICAS. In addition to meeting old friends and making new ones, ICAS is an opportunity dig into the details of the programs and processes that have made airshows some of the most exciting, yet safest, forms of entertainment available in North America. ICAS programming covers every level of airshow savvy, including a lot of material for those who are new to airshows or are just beginning to become involved in organizing and administering airshows. For those people, ICAS presents a seminar on Sunday of each year of the convention called Aishows 101: Air/Ground Operations Training Seminar. Last year, I took the next step. Even though I essentially get in free, I paid to attend Airshows 101 as a full-up student. I wanted to understand more about what goes into actually staging an airshow. And, while nobody walks out of Airshows 101 with everything they need to go put on an airshow, if you listen closely and ask a lot of questions, the program leaves you with a canoe-paddle-to-the-face appreciation for the depth and breadth of what goes into the process. I entertained fantasies last year of being able to put out an episode from ICAS that gave a genuine idea of what the class is like. I gave up around 0200 local the morning after the class. The approach this time is a little different. I took the audio home last year and edited it to create a few good examples of what the presentation is like. And I attended again this year, but spent more of the time putting together the text for this episode. 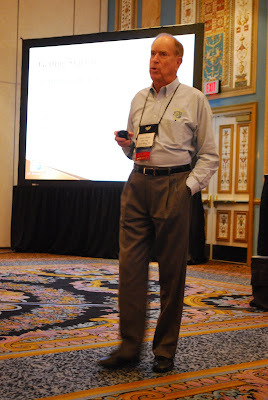 Thus, the presentation audio that you’ll hear in this episode is from ICAS 2010. But, having attended on Sunday, it’s virtually the same as the presentation that happened today in 2011. This is not an episode for the casual aviation enthusiast. This is about details, regulations, team requirements, and crowd experience. If you’re looking for lighter fare, I recommend one of the 200 or so back episodes until I get another one out. But, if you’re looking for a genuine scratch into the surface of what it takes to put on an airshow, this episode is a good starting place. I’m going to cover four basic topics. The request for military support, the general timeline, the Big Kahuna (namely FAA Order 8900.1), and the FAA Form 7711-2 waiver. There’s a whole lot more to it than this, but it’ll give you a small taste of what goes on in the background. Airshows 101 is presented by four experienced air bosses. 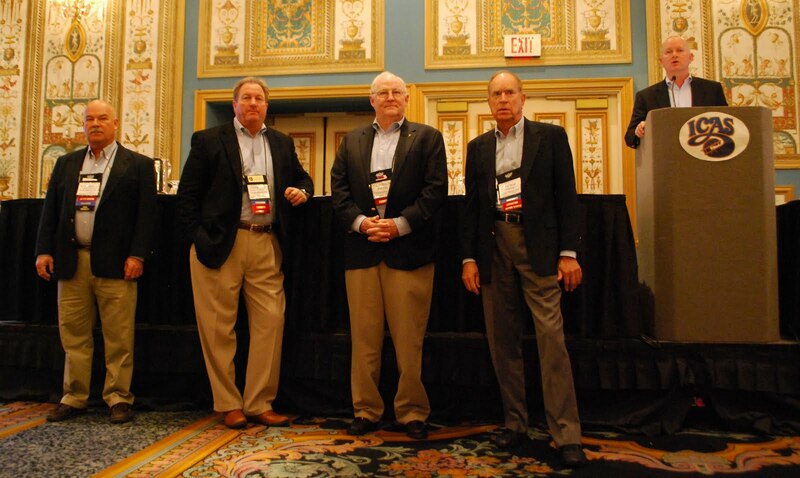 Bill Snellgrove, George Cline, Ralph Royce, and Larry Strain. The air boss is in charge of most of the air operations at any given airshow. And most air bosses are also valuable consultants to airshow organizers, assisting with planning, waivers, interaction with other stakeholders, and lots more. The job that they do from the roof of that trailer out in front of the crowd line is just the tip of the air boss iceberg. 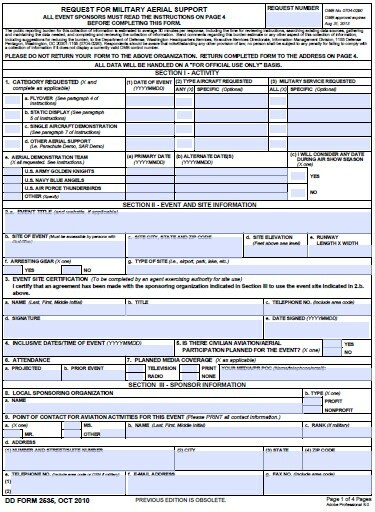 The key to military support is DD Form 2535 (http://www.dtic.mil/whs/directives/infomgt/forms/eforms/dd2535.pdf). In 2010, the Blue Angels went to a two-year system. If you want the Blues, you have to apply before August 1 of the second year prior to when you want them. In other words, as I sit here in 2011, we’re past the deadline for applying for the 2013 season. Even in the case of the Thunderbirds and others, August 1, 2011 was the deadline to apply for the 2012 season. Notwithstanding the military team deadlines, most essential planning starts at least eight months before the show. That’s the time to survey the event environment, look at the regs, and do the basic legwork to be sure that you can have the show at the intended airport. Assuming that the local planning for the event site is moving along reasonably, the biggest event in the early planning is the ICAS convention. The Thunderbirds, Blue Angels, and Snowbirds announce their schedules for the upcoming year (or, in the case of the Blues, the year after that). That’s a key programming point and it allows show organizers to figure out what kind of show they’re going to have. You select other performers based, to some extent, on whether you have a jet team performing. One wild card: The Black Diamond Jet Team (formerly known as Heavy Metal) is a fully-sponsored L-39 and MiG team. It’s not the Thunderbirds or the Blues or the Snowbirds. But it’s a genuine jet formation team that flies profiles that are very similar to, if not better than, the military jet teams in many respects. It’s too early to tell after just one season, but it’s going to be interesting to see if Black Diamond can anchor an airshow as well as the military teams. I’ve been lucky to get to know many of the guys from Black Diamond and interviewed two to appear in the first Acro Camp film. I’m pretty excited about the possibility that a purely civilian bootstrap organization can go anchor big shows just as well as the military teams. In any case organizers spend a lot of time on the exhibit hall floor and in the halls talking to performers and trying to nail down a slate of performers to fill out their show programs. There’s a little of everything. Airplanes and helicopters, to be sure. But also jet trucks, pyro, and other attractions. And, in any case, many of the vendors are also here. Providers of things like radios, PA equipment, golf carts, ticketing, food, midway attractions, aerial video, insurance, announcing, airboss services, and everything else that it takes to put together an airshow. Back at the show site (and the show site’s FSDO), the plans keep going for the next few months. Work on things like the operations plan, FAA/TC coordination, waiver applications, emergency plans, locating arresting barriers if you need them, locating other support equipment, and so on. Things get more immediate when you hit the four-month point. At that time, you submit your FAA Form 7711-2, the request for the airshow waiver. You also request military statics, arrange hotels and rental cars, and get serous about your local police, fire, EMT, and other planning. At three months out, you finalize your air-ground procedures, get working on your static arrival and parking plan, start holding monthly organization and staff meeting plans, and nail down your static display, security, communications, and vehicle control plans. At two months out, things get really busy. Organization and staff meetings go to bi-weekly. You’re thinking transportation, ingress, and egress plans for performers and staff. If you’re really smart, you run at least a couple of tabletop exercises with your section chiefs, especially your emergency responders. From there on in, it gets really frantic and really granular. Failure to plan and have a solid organization by this point is potentially fatal to the event. You’ve heard that “no battle plan survives first contact with the enemy?” This is where the battle plan makes first contact. It isn’t so much about execution of the plan as it is having an organization that’s strong and capable enough to deal with exceptions to the plan and deals with them in a way that preserves safety while still resulting in a superior experience for the crowd. The Big Kahuna in airshow planning is FAA Order 8900.1, and particularly Volume 3, Chapter 6. There’s a copy at http://fsims.faa.gov/wdocs/8900.1/v03%20tech%20admin/chapter%2006/03_006_001.pdf if you’re interested. That, together with the FARs, FAA Advisory Circulars, performer support manuals, and ICAS manuals and guidelines, make up your core group of constraints. The most concrete manifestation of the rules happens when you sit down to do or review your site survey. The site survey includes the airshow area, locations of where you’ll place spectators, the locations of towers, highways, buildings, hospitals, and the airspace over and near the show site. Among the issues is getting an idea of what’s close to the show site. You’ve probably noticed that different performers do different things at different distances from the crowd. This is by design. There are five lines in most airshow layouts. Category I, II, and III are for aerobatic maneuvering. The other two are for non-aerobatic maneuvering. And, by the way, for the purposes of airshows, “aerobatic” means pitch in excess of 60 degrees up or down or bank of 75 degrees. The Category I line is for aircraft capable of operating at more than 245 knots at max gross and certain power settings. That’s your jet teams and similar performers. The Cat I line must be 1,500 feet away from the crowd. You can drop part of that line to 1,200 feet under certain circumstances. The Cat II line is for aircraft that do more than 156 knots but less than 245 knots and for helicopters (here meaning essentially Chuck Aaron). The Cat III line is for aircraft that do 156 knots or less or any single-engine aircraft with a normally-aspirated or fuel-injected reciprocating engine with a max gross of 2,250 lbs. or less. For non-aerobatic flight, you can put powered parachutes, powered paragliders, paragliders, and ultralights as close as 100 feet from the crowd. Everybody else can come as close as 500 feet as long as they’re not aerobatic. That’s why, in the Hoppers promo video that you’re seen in the feed, the aircraft are out at the big white Cat I line when they’re doing rolls and other aerobatic maneuvers, but they can do high-speed level passes much closer at the 500-foot line. The amount of room that you have and your ability to place various Cat lines has a lot to do with what performers you can book and what they can do during the show. Additionally, you have to deal with buildings and other areas in which you have people during the show. The lines are critical for safety. Some of the teams, particularly the Thunderbirds and the Blue Angels, are particular about how you mark show center and the Cat I line. And there are other boundaries that you need to identify, mark, and police. The relevant part of 8900.1 goes on for more than 100 pages. And it’s in its 86th change, so you know that it’s updated regularly, if not aggressively. It’s actually a really good read. It’ll answer questions that you didn’t even know you had about airshow operations. 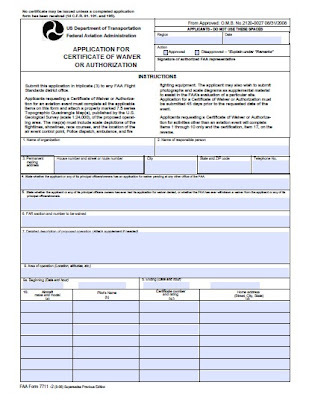 The airshow waiver is another huge element of the process. If you think about it, in the absence of a waiver, most airshow flying would violate one reg or another without a waiver. Think about it. Even a low pass is technically a reg violation if you don’t have a waiver. I see it violated all the time, even with ATC clearance. And I violated it myself in early training whenever an instructor got down low and illustrated the use of aileron and rudder in the process of teaching crosswind landings. You can’t fly lower than the minimum altitudes in the FARs unless you’re taking off or landing. Unless you’re out over Muroc Dry Lake Bed or similar terrain, that means 500 or 1,000 feet from persons and property. Intent counts. You can’t just fake a go-around. There’s other stuff that you might not think about. One thing that surprised me was fuel. I realized it when I was looking over the waiver for the IAC contest in which I participated this year. In many aerobatic aircraft, you can’t carry VFR fuel reserves and still do what you want or need to do for the contest. So the waiver lets you carry less fuel. Essentially, as long as you can glide to the runway, you’ve got enough fuel. Airshow waivers cover these and other situations. The following are just a few examples. FAR 91.107(a) requiring seatbelts and their use. Think of wing-walkers here. FAR 91.117(a)-(c) governing maximum airspeeds. You need a waiver to fly at airshow speeds below 10,000 feet in Class B, C, or D airspace. 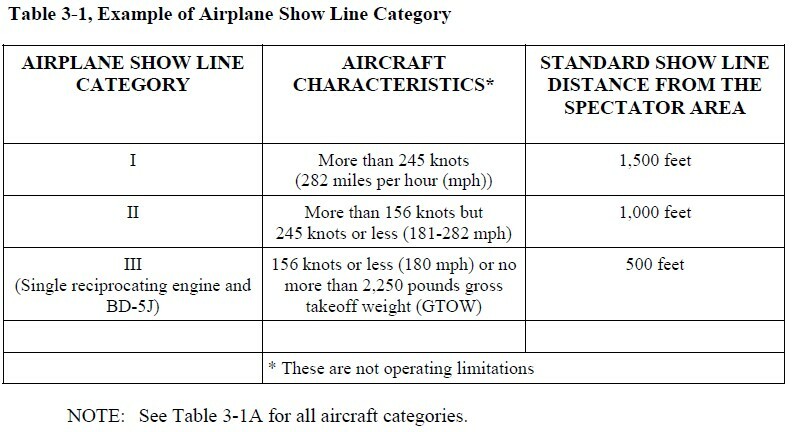 FAR 91.119(b) and (c) governing minimum safe altitudes. FAR 91.126, 91.127, 91.129, and 91.131 governing operations in the vicinity of airports in Class G, E, D, and C airspace, respectively. FAR 91.155 governing VFR minima and cloud clearances. FAR 91.303(c), (d), and (e) governing where aerobatic maneuvers may be performed. FAR 91.515(a) governing large and turbine-powered aircraft. The waiver covers all of these elements and more. 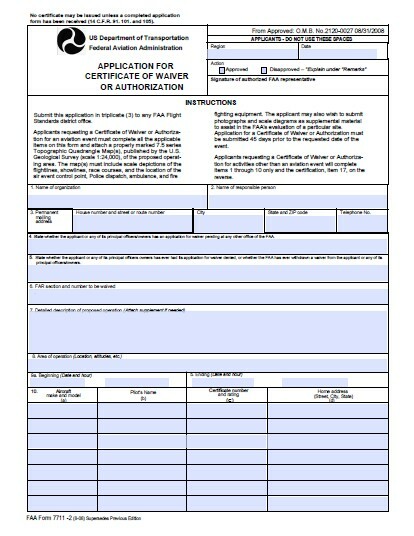 You can see typical provisions of an FAA airshow waiver at www.faa.gov/about/initiatives/airshow/. That, among other reasons, is why most airshow flying is back and forth in front of the crowd at one of the Cat lines. I’ve observed before that airshows tend to be rather two-dimensional for that reason. 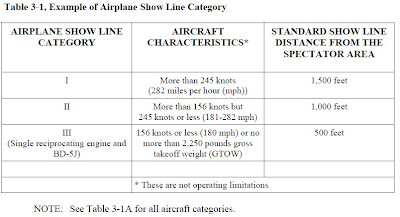 Notable exceptions are Gene Soucy, Kent Pietch, Greg Koontz, and several others who fly slower or less powerful aircraft and are able to make more use of the Y axis of the box. This is because the aircraft are slow enough that they can fly toward – or away from – the crowd for longer while still staying beyond the Cat III line. And because the aerobatic energy carried by the airframe in each case would dissipate more quickly than for other aircraft and fall short of the crowd line. But it’s also an opportunity for performers with those kinds of profiles to differentiate themselves. I think that the audience really responds to more three-dimensional performances. You can’t compromise safety, so the distance and the aerobatic energy requirements are non-negotiable. Thus, those who are able to incorporate that beautiful third dimension into their performances have a real advantage. Anyway, those are the highlights of Airshows 101. The course runs a full day and it’s more than you can really put into a single episode. And, even if you could, Airshows 101 itself just scratches the surface of what it takes to put on an airshow. It’s the wee hours of Tuesday morning as I’m recording this. I’ll be pulling up stakes here at Firebase Airspeed at Paris Las Vegas tomorrow and catching a redeye flight out tonight for Detroit. It’s Flight Suit Day here at ICAS. All pilots and performers are encouraged to wear their flight suits. Although I own a zoom bag (and I’m very fond of it!) I haven’t really had the opportunity to wear a flight suit here at ICAS in years past. Yeah, I fly and I even fly acro, but just slapping an Airspeed squadron patch on the flight suit would seem kind of disingenuous in this crowd. But I am a genuine search and rescue pilot in the Civil Air Patrol. And national and the Nevada Wing have authorized me to wear my CAP flight suit and carry the CAP flag for the day. So I’ll be on the exhibit floor at ICAS in a zoom bag. Sierra Hotel!